It’s kind of fun when our birthdays come around. Mine is January 29th and Dave’s on the 31st, so we are just two days apart. This means duo celebration every year! For the last few years, there has been a Maximized Living seminar on our birthdays since we fall on the weekend. Usually this means a January birthday trip to Orlando, FL on our birthdays for training in chiropractic and nutrition, and hope we can sneak outside a little thru the weekend to enjoy the sun! Thankfully this year we live right here in Orlando and the seminar is just a short drive away from our house! 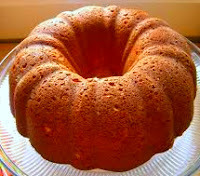 This recipe works best in a bundt pan in order to get the batter to cook thru the middle without burning. You could probably get away with making two 8″ or 9″ round cake layers, but I haven’t tried it yet. Bake until a clean knife inserted comes out clean. 1.) Preheat oven to 350 degrees F. Grease a 12 cup bundt pan with coconut oil and sprinkle with fine ground almond flour to flour the pan. Invert pan and tap lightly to remove excess almond flour. Set aside. 2.) Puree thawed strawberries in a food processor or blender. Since I only had a 16 oz pack of strawberries, bear with me on these reservations: Reserve 3/4 cup of blended strawberries and refrigerate for another use (don’t need this portion for the recipe, would be great in smoothies or other dessert). Also reserve 2 tablespoons puree, pour into a mesh strainer and place over a small bowl. This portion is for the strawberry cream frosting and we want to remove the seeds. Occasionally scrape thru the strawberry puree pushing the juice thru and leaving the seeds in the strainer. The remaining about 1 cup of puree is for your cake! 3.) Place butter, coconut oil, xylitol, and stevia in mixer bowl. Cream together on Medium speed for about 5-6 minutes, scrapping down beaters and bowl with rubber spatula as needed (I had to twice with my Kitchen Aid). You’re looking for a light fluffy mixture. 4.) In a medium bowl, mix together the coconut flour, almond flour, sea salt, and baking powder. In a separate medium bowl, whisk together the eggs, coconut milk, 1 cup of strawberry puree, almond extract, vanilla extract and lemon juice. 5.) Add half of the dry ingredients to the mixer bowl with xylitol/butter mixture and mix on Low speed for 30 seconds or until moistened. Scrape down bowl. Add half of the wet ingredients and mix on Low speed until incorporated, about 30 seconds. Scrape down bowl. Repeat with remaining dry and wet ingredients, scraping down bowl after each addition. Finally, mix on Medium-High speed for 1 1/2 minutes, then scrape down bowl and beater. 6.) Pour batter into prepared bundt pan and bake in oven for 45-55 minutes, until a clean knife inserted in center comes out clean. 1.) Make “powdered xylitol” to use in place of powdered sugar/confectioners sugar in this frosting. Here’s a great trick. In small batches, pulverize your xylitol by dropping thru the lid of your blender (on High speed) to create a fine powder. Do this to the entire 2 cups and transfer the powdered xylitol to a medium bowl. Whisk in the arrowroot powder. You now have powdered xylitol! I usually make a double batch and store in an airtight container in the pantry for future use. 2.) In a mixer bowl on Medium speed, cream together the butter and cream cheese. Add the 2 tablespoons of strained strawberry puree, lemon juice and vanilla extract. Wait about 30 seconds. Add in the powdered xylitol mixture 1/2 cup at a time until your frosting forms and is nice, fluffy, and pink! This should take maybe 2-3 minutes. 3.) Once cake is cooled, you can frost away. Extra frosting can be covered and saved in the fridge for later. (I think this frosting would be great over these Advanced Plan fluffy pancakes!) ENJOY! :) This cake is heaven! Can’t wait to try this one! Elise, it’s strawberry season now — hope to see more recipes!! See you at Seminar! Where would I find xylitol in London? What exactly do you mean by “full-fat” coconut milk? And is it the unsweetened kind as well? Also, how do you know if xylitol is from birch instead of corn? Melanie – “Full-fat” coconut milk means just like it sounds, none of the health, omega-rich fat has been removed from it. However, if you purchase “Lite” coconut milk, it has been heated (denatured) to remove that fat. In my opinion it’s pointless to use the coconut milk if the fat has been removed. To know if xylitol is from birch vs corn, read the label. I only buy xylitol that tells you its source in writing, right on the label. You’ll pay about 25% more the price for it compared to the corn variety, but it’s so worth it! Your body will thank you! Just made this for the second time since you posted the recipe…and I have shared it with all my friends. It is delicious. Thanks so much!!! think these could be made eggless somehow? maybe with applesauce and additional coconut flour? 1.) Flaxseeds are a pretty good egg replacer as they are high in omega 3 fatty acids. Stir together in a small bowl. Let sit a couple minutes and the mixture will become glutinous – like an egg white. To test, when you lift the mixture out of the bowl and let it drop, it should resemble that raw eggy texture. If not, let sit longer. This substitution works best in heavy breads, dense cakes, cookies, muffins, etc. 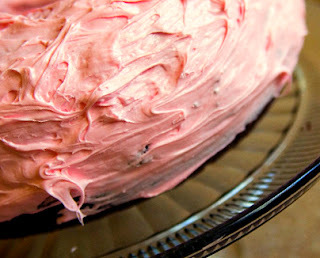 And will cause your batter to go dark in color, so probably not an ideal choice for this particular pretty pink cake. 2.) Baking soda & vinegar – the chemical reaction between the two helps to make baked recipes nice and fluffy. The vinegar taste cooks out and the end product is light and fluffy, perfect substitute for cakes and other baked goods. How I do it is mix together all the other recipe ingredients to form the batter. In a separate bowl, mix together the vinegar and baking soda. Once it fizzes up, add to the cake batter and fold it in with a spatula (don’t whisk or beat it in. Will ruin the bubbles). You’ll be amazed at the results! Hope one of these methods turns out great for you. I haven’t tried either with this particular cake just yet, but these are my two fall back methods in the event I’m out of eggs and want to make brownies or something like that. ENJOY! Hope you have luck! Come back and let me know how it turns out! Elise, do you suppose this recipe will work as is for cupcakes? Or is there something i need to add/take away? The recipe should work as is for cupcakes, Melinda. Start by baking for 20 mins at 350′F then check it every 5 mins after that for doneness. I really wanted to make this recipe for this weekend and cannot find Xylitol locally (not even at Whole Foods) and don’t have time to place an order online. Is there any way I can make this without Xylitol? I have plenty of stevia on hand. Hi Miranda, I’m very surprised your town’s WF doesn’t have xylitol. Unfortunately this recipe needs the xylitol’s volume for the whipped frosting. Stevia just won’t perform well here. I made this cake with cherries instead of strawberries and it was delicious. I never got around to the frosting because we were running out the door with the cooling cakes on the cooling rack and the cherry pie filling in another container to be assembled at my friend’s house, but it was still good, even without the frosting. I also used my layer pans instead of the bundt pan and baked them for 30 minutes. Could I substitute something for the full-fat coconut milk, or is it an important component for this to turn out right? ← Are You Ready for Some Football?